The Lucas 18D2 distributor was used on Dominators and Triumphs of the late 50s also some AJS twins. Then BSA used the 18D1 on the later B31 and B33. (this being the single cylinder points housing with the same casting and drive shaft.) We have manufactured a small pickup plate specifically to fit into this housing, and incorporate the Boyer Bransden amplifier system as used successfully for many years on the big twins. One of the Boyer rotors with a small amount of machining will also fit this set up. 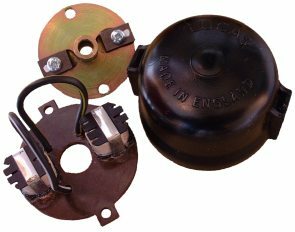 The kit supplied normally contains a Boyer Mk.III amplifier, a pair of 6V ignition coils & clamps, pickup wires, a pickup plate & rotor, with screws to fit, and instructions! Fitting of the rotor to the distributor shaft is straight forward after removal of the bob weights / springs, but a few points will need attention. End float in the shaft needs to be attended to if it is excessive, or the rotor will touch the rear of the pickup plate. Any side play due to worn shaft bearing should also be attended to while you are about it. When the rotor is fitted it has to be machined / filed so that it does not touch the rear of the pickup. This would best be done in a lathe but it can be done by careful filing. All the distributor work can be done by us, so please enquire. The normal twin dizzy cap (and spark rotor) is no longer needed so we suggest you purchase and fit the black plastic cover as fitted to the 18D1 (available from us). This gives a very neat unit, although sane people prefer the 'original' look and run dummy HT cables up under the tank. It is vital to time the Boyer system by strobe for correct timing, so you will have to set up some strobe-able marks usually at the alternator with respect to your engines fully advanced ignition timing point.